Vancouver, B.C. – Corvus Gold Inc. (“Corvus” or the “Company”) - (TSX: KOR, OTCQX: CORVF) announces the filing of an independent NI-43-101 technical report on the new resource calculation for its 100% owned North Bullfrog Project, Nevada. Â This independent resource calculation incorporates new drilling conducted in 2012 and 2013 which was used to calculate a new mineralization inventory for the Yellowjacket and Sierra Blanca portions of the project.Â However, in the technical report the entire project Mineral Resource estimate has been updated (Table 1) using Corvus Gold’s new reporting criteria which only reflects that portion of the mineralization inventory which falls within a conceptual WhittleTM pit shell and would be scheduled for processing as defined at a US $1300 gold price. Â The WhittleTM pit optimization process is not a full economic analysis but it does indicate what portions of the mineralization inventory might have reasonable prospects for economic extraction by open pit mining given assumed mining, processing, administrative costs and metal recovery at a specific gold price (Table 2). In comparison to the estimated resource at 0.3 g/t Au cut-off grade announced on February 25, 2014 (NR14-07), the Table 1 Yellowjacket Indicated Mineral Resource has 6% higher Au grade and 2% less contained gold and the Inferred Mineral Resource has 34% higher grade and 30% less contained gold.Â The Table 1 Disseminated Indicated Mineral Resource at 0.1 g/t has 12% higher grade and 22% less contained gold, and the change in Inferred Mineral Resource is 6% higher grade and 17% less contained gold. Â The differences arise from the use by the Company of a more rigorous approach to determining reasonable prospects for economic extraction, which has resulted in an estimated mineral resource that the Company believes better reflects the potential of the North Bullfrog Project compared to the less constrained method utilized in the past.Â The Company believes that the parameters used in the WhittleTM pit optimization process (Table 2) are realistic and reasonable based on comparisons with similar projects in the area. To illustrate the sensitivity of the estimated resource to changes in the gold and silver price, Table 3 shows the portions of the mineralization inventory falling within WhittleTM pit shells that would be scheduled for processing at various gold prices from US $700 to US $1,500. Â Of note is that, given a US $900 per ounce gold price, the Yellowjacket deposit (milling) has an estimated Indicated Mineral resource of 1.99 Mt at an average Au grade of 1.53 g/t for 98,000 contained Au ounces, and an estimated Inferred Mineral resource of 8.82 Mt at an average Au grade of 1.39 g/t for 394,000 contained Au ounces (both at a 0.38 g/t Au cutoff), and the disseminated deposits (heap leach) have an estimated Indicated Mineral Resource of 15.07 Mt at an average Au grade of 0.32 g/t for 155,000 contained Au ounces and an estimated Inferred Mineral Resource of 91.09 Mt at an average Au grade of 0.22 g/t for 644,000 contained Au ounces, both at a 0.18 g/t Au cutoff). Jeff Pontius, Corvus CEO, stated “The new initial Yellowjacket resource linked with our ongoing exploration success on new high-grade vein system discoveries indicates that there is significant potential to grow this deposit.Â Our initial drilling focus remains on the continued expansion of the Yellowjacket Deposit along strike and at depth as well as other new parallel and internal systems like the West Vein.Â In addition, we plan to drill other new, large untested systems to the west of Yellowjacket and in the District as a whole in the coming months with the aim of further unlocking the potential of this new Nevada high-grade gold-silver discovery. Mr. Scott Wilson of Metal Mining Consultants, Inc., Mr. Gary Giroux of Giroux Consultants Ltd. and Mr. Herbert Osborne of H. C., Osborne & Associates were retained by Corvus to prepare a new mineral resource estimate for the North Bullfrog Project.Â The new resource estimate, which has an effective date of March 25, 2014, is contained in a NI 43-101 technical report dated April 1, 2014 entitled “Technical Report - The North Bullfrog Project, Bullfrog Mining District, Nye County, Nevada” and filed on SEDAR on April 2, 2014 (the “Report”). Corvus Gold and its independent qualified persons (QP’s) as defined by NI 43-101 have taken a new approach to their estimate of the mineral resource at North Bullfrog with the publication of the Report.Â This new standard limits the estimated mineral resource to that portion of the geostatistically modeled mineralization inventory which is contained within a conceptual WhittleTM pit and scheduled to processing at a US $1,300 gold price. The WhittleTM optimization process considers three parameters simultaneously, which are: the value of recoverable metal in each block in the mineral inventory; the costs of mining, processing and administration for that block; and the realistic geometrical development of the open pit. Â If the value exceeds the costs and the integrity of the pit is maintained then each block within the pit shell is scheduled either to the process stream or to waste. Mr. Giroux produced the updated estimate of the North Bullfrog mineralization inventory (effective as at March 25, 2014), based on resource drilling in the Sierra Blanca and Yellowjacket areas of the North Bullfrog Project that occurred in 2012 and 2013 (Figure 1).Â The new mineral inventory calculation includes an additional 16,209 samples derived from 111 holes totalling 23,020 metres with an average depth of 207 metres.Â The inventory also incorporates an updated geologic model and additional rock density data.Â Previous mineralization inventory estimates from the Jolly Jane, and Mayflower deposits were not updated because no additional drilling has been conducted in those areas (Figure 1). To estimate the mineral resource for North Bullfrog, Mr. Wilson utilized the block models of mineralization prepared by Mr. Giroux as part of the input data for his estimation of that portion of the mineral inventory that was contained within the US $1300 open pit shell defined by the Lerchs-Grossman algorithm used in the WhittleTM Program, and which would be scheduled to be sent to a processing facility. The structurally controlled mineralization in the Yellowjacket Zone was modelled separately in several geologically defined domains to prevent smearing of high-grade mineralization into the surrounding blocks. Â For the purposes of estimating the mineral resource, the different Yellowjacket domains have been combined because of the geological similarities. Â Based on the current metallurgical data on Yellowjacket mineralization, it has been assumed that this material will be processed through a separate milling circuit and thus carries different processing costs and recoveries resulting in cut-off grades different than the heap leach processing.Â These additional costs and recoveries have been accounted for in the WhittleTM pit analysis. The disseminated mineralization at Sierra Blanca was also modeled in a series of discrete volumes to prevent grade smearing across certain important grade-controlling faults. Â The disseminated oxide mineralization has been modeled based on Corvus’ current metallurgy for heap leach processing with each block having an estimated heap leach recovery.Â The heap leach feed then carries the costs associated with heap leach processing as reflected by the cut-off grade. 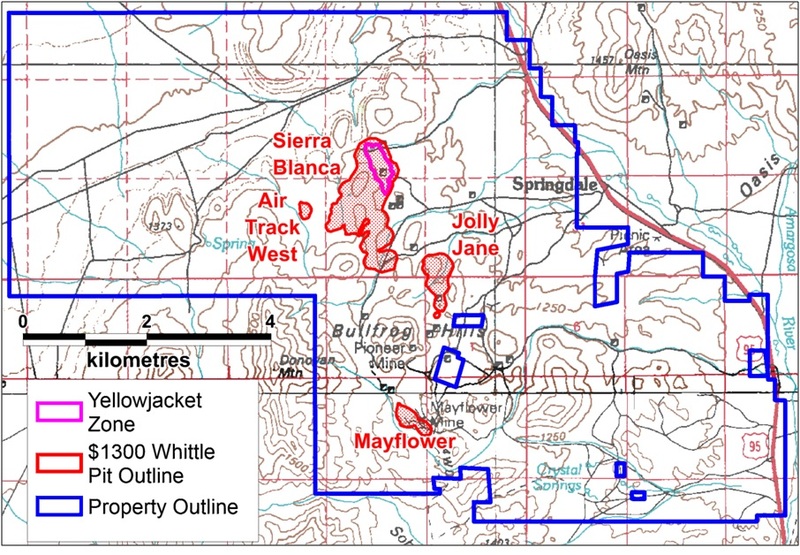 The North Bullfrog project mineralization inventory now includes five deposit areas: Yellowjacket, Sierra Blanca, Air Track West, Jolly Jane and Mayflower (Figure 1).Â Mineralization occurs in two primary forms: (1) broad stratabound bulk-tonnage gold zones such as the Sierra Blanca and Jolly Jane systems; and (2) moderately thick zones of high-grade gold and silver mineralization hosted by structural zones with breccias and quartz-sulphide vein stockworks such as the Yellowjacket and Mayflower targets.Â The Yellowjacket, Sierra Blanca and Jolly Jane deposits remain open and are current exploration targets for the Company in 2014. The Yellowjacket estimated resource area is immediately east of the Sierra Blanca deposit and was modeled as a specific zone within the greater Sierra Blanca deposit.Â The zone has a North-Northwest trend and is currently defined by the Josh Vein on the west and the Liberator Fault on the east. Â This zone includes vein and stockwork vein type mineralization controlled by the interaction of the two structures. Â While the main vein drilled to date has a NNW trend, the step over structures between the main faults appears to have a north-easterly trend.Â Although the bulk of the indicated mineralization within the current resource estimate is hosted by one vein system, other veins have been intersected by the drilling and will be further explored with the ongoing exploration program. Corvus controls 100% of its North Bullfrog Project, which covers approximately 68 kmÂ� in southern Nevada just north of the historic Bullfrog gold mine formerly operated by Barrick Gold Corp.Â The property package, shown in Figure 2, is made up of a number of private mineral leases of patented federal lode mining claims and 758 federal unpatented lode mining claims.Â The Project has excellent infrastructure, being adjacent to a major highway and power corridor. The work program at North Bullfrog was designed and supervised by Russell Myers (CPG 11433), President of Corvus, and Mark Reischman, Corvus Nevada Exploration Manager, who are responsible for all aspects of the work, including the quality control/quality assurance program.Â On-site personnel at the project log and track all samples prior to sealing and shipping.Â Quality control is monitored by the insertion of blind certified standard reference materials and blanks into each sample shipment.Â All resource sample shipments are sealed and shipped to ALS Chemex in Reno, Nevada, for preparation and then on to ALS Chemex in Reno, Nevada, or Vancouver, B.C., for assaying.Â ALS Chemex’s quality system complies with the requirements for the International Standards ISO 9001:2000 and ISO 17025:1999.Â Analytical accuracy and precision are monitored by the analysis of reagent blanks, reference material and replicate samples.Â Finally, representative blind duplicate samples are forwarded to ALS Chemex and an ISO compliant third party laboratory for additional quality control. Jeffrey A. Pontius (CPG 11044), a qualified person as defined by National Instrument 43-101, has supervised the preparation of the scientific and technical information that form the basis for this news release and has approved the disclosure herein.Â Mr. Pontius is not independent of Corvus, as he is the CEO and holds common shares and incentive stock options. Mr. Scott E. Wilson, SME, President of Metal Mining Consultants Inc., is an independent consulting geologist specializing in mineral reserve and resource calculation reporting, mining project analysis and due diligence evaluations.Â He is acting as the Qualified Person, as defined in NI 43-101, for the overall technical report, and specifically for the Mineral Resource Estimate (other than the estimate of the North Bullfrog mineralization inventory).Â Mr. Wilson has over 23 years experience in surface mining and is a Registered Member of the Society of Mining, Metallurgy and Exploration.Â Mr. Wilson and Metal Mining Consultants, Inc. are independent of the Company under NI 43-101. Mr. Gary Giroux, M.Sc., P. Eng (B.C. ), a consulting geological engineer employed by Giroux Consultants Ltd., has acted as the Qualified Person, as defined in NI 43-101, for the estimate of the North Bullfrog mineralization inventory.Â He has over 30 years of experience in all stages of mineral exploration, development and production.Â Mr. Giroux specializes in computer applications in ore reserve estimation, and has consulted both nationally and internationally in this field.Â He has authored many papers on geostatistics and ore reserve estimation and has practiced as a Geological Engineer since 1970 and provided geostatistical services to the industry since 1976.Â Both Mr. Giroux and Giroux Consultants Ltd. are independent of the Company under NI 43-101. Mr. Herbert Osborne, SME, a consulting metallurgist, has acted as the Qualified Person, as defined by NI 43-101, for evaluation of the metallurgical testing data. Â He has over 50 years of experience in mineral process design and operations. Â He is a registered Member of the Society of Mining, Metallurgy and Exploration (SME Member No. 2430050 RM). Â Mr. Osborne is independent of the Company under NI 43-101. Corvus Gold Inc. is a North American gold exploration company, which is focused on advancing its 100% controlled Nevada, North Bullfrog project towards a potential development decision.Â In addition, the Company controls a number of other North American exploration properties representing a spectrum of gold, silver and copper projects.Â Corvus is committed to building shareholder value through new discoveries and leveraging noncore assets via partner funded exploration work into carried and or royalty interests that provide shareholders with exposure to gold production. This press release contains forward-looking statements and forward-looking information (collectively, “forward-looking statements”) within the meaning of applicable Canadian and US securities legislation.Â All statements, other than statements of historical fact, included herein including, without limitation, statements regarding the anticipated content, commencement and cost of exploration programs, anticipated exploration program results, the discovery and delineation of mineral deposits/resources/reserves, the potential to develop multiple Yellowjacket style high-grade zones, the Company’s belief that the parameters used in the WhittleTM pit optimization process are realistic and reasonable, the potential to discover additional high grade veins or additional deposits, the potential to expand the existing estimated resource at the North Bullfrog project, the potential for any mining or production at North Bullfrog, the potential for the Company to secure or receive any royalties in the future, business and financing plans and business trends, are forward-looking statements.Â Information concerning mineral resource estimates may be deemed to be forward-looking statements in that it reflects a prediction of the mineralization that would be encountered if a mineral deposit were developed and mined.Â Although the Company believes that such statements are reasonable, it can give no assurance that such expectations will prove to be correct.Â Forward-looking statements are typically identified by words such as: believe, expect, anticipate, intend, estimate, postulate and similar expressions, or are those, which, by their nature, refer to future events.Â The Company cautions investors that any forward-looking statements by the Company are not guarantees of future results or performance, and that actual results may differ materially from those in forward looking statements as a result of various factors, including, but not limited to, variations in the nature, quality and quantity of any mineral deposits that may be located, variations in the market price of any mineral products the Company may produce or plan to produce, the Company's inability to obtain any necessary permits, consents or authorizations required for its activities, the Company's inability to produce minerals from its properties successfully or profitably, to continue its projected growth, to raise the necessary capital or to be fully able to implement its business strategies, and other risks and uncertainties disclosed in the Company’s 2013 Annual Information Form and latest interim Management Discussion and Analysis filed with certain securities commissions in Canada.Â All of the Company’s Canadian public disclosure filings may be accessed via www.sedar.com and readers are urged to review these materials, including the technical reports filed with respect to the Company’s mineral properties. This news release contains information with respect to adjacent or similar mineral properties in respect of which the Company has no interest or rights to explore or mine.Â The Company advises US investors that the mining guidelines of the US Securities and Exchange Commission (the “SEC”) set forth in the SEC’s Industry Guide 7 (“SEC Industry Guide 7”) strictly prohibit information of this type in documents filed with the SEC.Â Readers are cautioned that the Company has no interest in or right to acquire any interest in any such properties, and that mineral deposits on adjacent or similar properties, and any production therefrom or economics with respect thereto, are not indicative of mineral deposits on the Company’s properties or the potential production from, or cost or economics of, any future mining of any of the Company’s mineral properties.